As I stepped in, from a long taxing day into the premises of The Residence by Cenizaro at Maldives, I knew a magic was awaiting me. My fatigue completely rolled away as I reached my water-villa which was my abode for three days. This was my first-time stay at the water-villa. The Residence promises a world away from the routine. It has so much to offer you with style and luxury. If you are a luxury traveller who loves marine life like me, you will completely adore every minute spent here. The Residence Maldives gives you the feeling of being completely you..a feeling of rejuvenation and relaxation. The aura of the resort is full of positivity which comes with discreet hospitality. I have uploaded a video of my water-villa which I am sure will leave you with goosebumps. 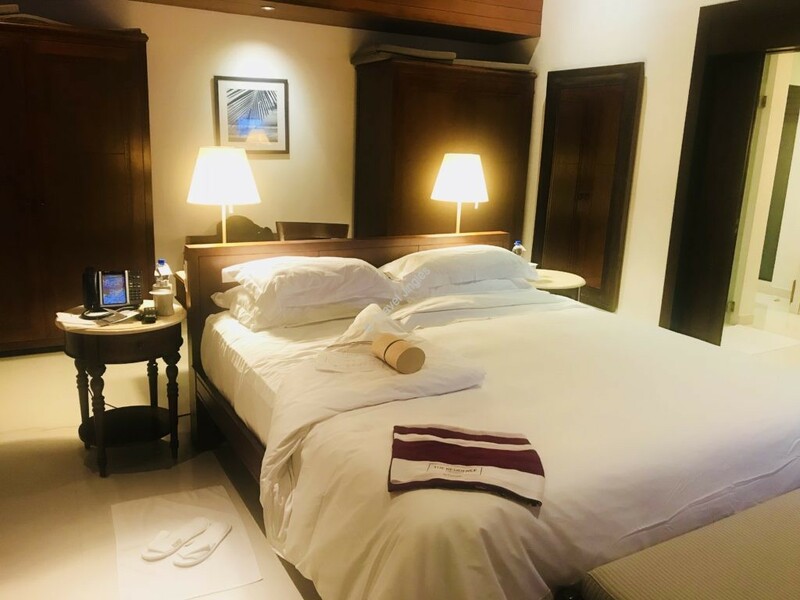 I could not miss the resort’s interior which completely blends the traditional Maldivian architecture with contemporary elegance and modern comforts. The Residence is designed in the lap of nature. If one side of the resort beholds the sun-kissed beachfront where waves crash at your feet, the other side of the resort extends further to the clear turquoise water of the lagoon for a private time snorkelling with your beloved at your private water-villa or simply laze at your villa’s deck adoring the beauty it holds. 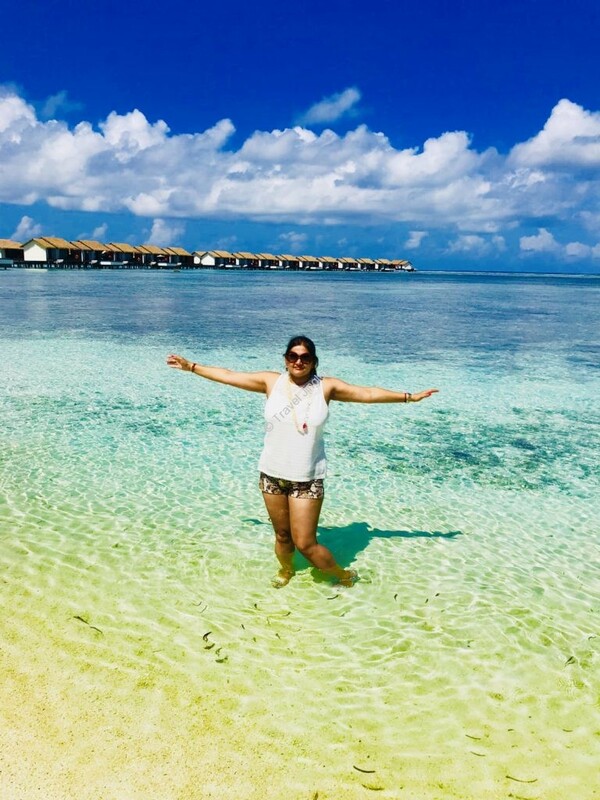 Look at the backdrop, the fifty shades of turquoise blue-green lagoons are widespread over some kilometres and merge into the deep sea, Indian Ocean and further meets the clear sky. The entire episode was stunning and nothing less than a scenery. 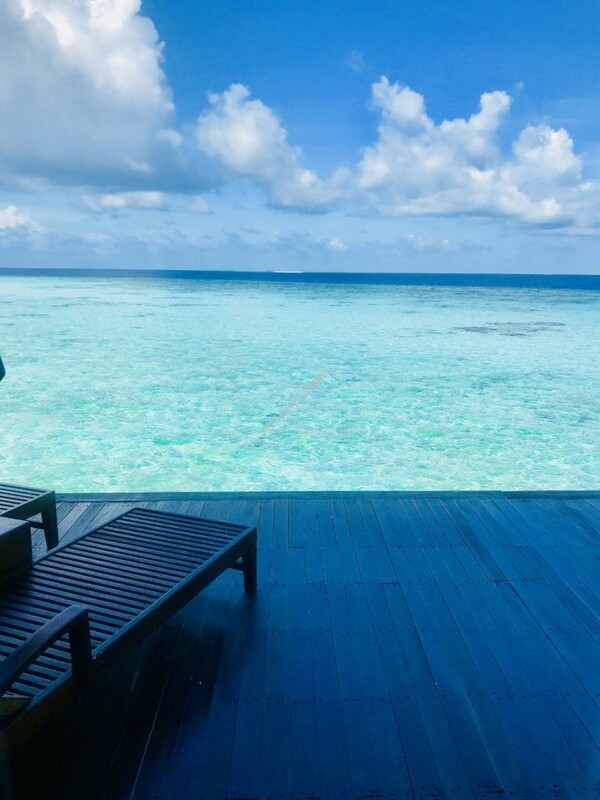 I enjoyed the outstanding view of the deep blue ocean, just sipping my cup of coffee on the deck of my water villa. 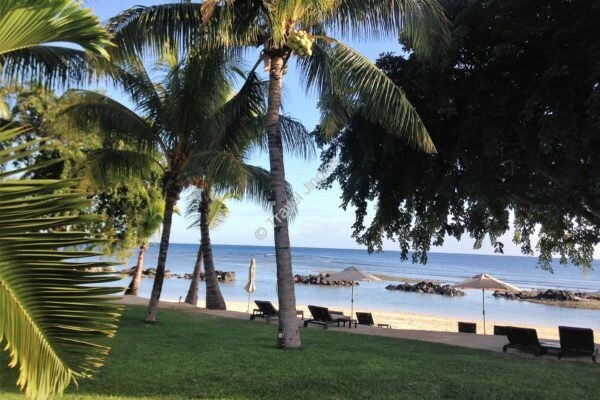 The best part of my villa was, it came with the luxury of slipping straight from my room’s deck into the cool, clear waters to reach my own private lagoon. I enjoyed swimming and snorkelling in the clear water. The resort has 94 villas which are classic yet modern in style and have colonial look which is visible from its high ceilings and French windows, each is an airy, light-filled cocoon, balancing a sense of intimacy with stunning 360-degree views. The design of the villas is inspired from the island’s enormous beauty, expressed in thatched roofs, natural materials and lush fabrics. All villas come with well-matched furnishings, teamed with local artefacts and wall art. For me, my water villa was nothing less than a heavenly way stay in one of the most beautiful places on Earth- Maldives. 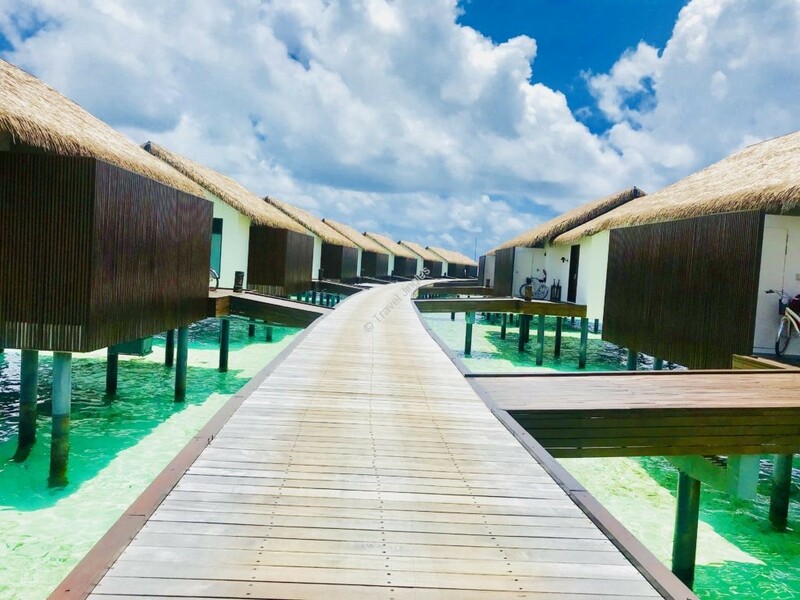 Whether seeking the perfect couple’s retreat or a memorable family holiday, surrender to the enchantment of The Residence Maldives and you will surely carry a bag pack full of exciting memories. This trip was hosted by Sri Lankan Airlines and The Residence by Cenizaro- Maldives. Such a great article. Beautiful photos! Indeed it is one of the most beautiful place I have visited. 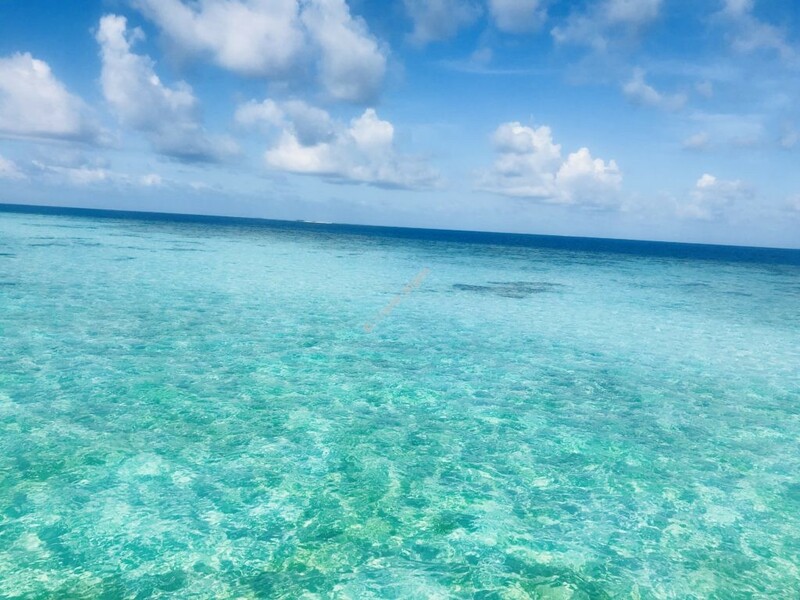 Maldives looks so amazing in your clicks and the water villa is so beautiful..
You have made me fall in love with Maldives. This looks to be such a lovely property. I just want to mention I am beginner to weblog and really loved you’re website. More than likely I’m going to bookmark your site . You absolutely come with outstanding stories. Regards for revealing your web-site. Hi there would you mind letting me know which webhost you’re utilizing? I’ve loaded your blog in 3 different web browsers and I must say this blog loads a lot quicker then most. Can you recommend a good web hosting provider at a honest price? Kudos, I appreciate it! Thank you, I’ve recently been looking for info approximately this topic for ages and yours is the best I’ve came upon so far. But, what in regards to the conclusion? Are you positive about the source? Thank you for sharing excellent informations. Your web-site is very cool. I am impressed by the details that you have on this website. It reveals how nicely you perceive this subject. Bookmarked this web page, will come back for more articles. You, my pal, ROCK! I found simply the info I already searched everywhere and simply couldn’t come across. What a great web site. Someone necessarily assist to make significantly posts I’d state. That is the very first time I frequented your website page and thus far? I surprised with the research you made to make this particular post amazing. Great process! Fantastic goods from you, man. I’ve understand your stuff previous to and you’re just extremely wonderful. I actually like what you have acquired here, really like what you’re saying and the way in which you say it. You make it entertaining and you still care for to keep it smart. I can’t wait to read far more from you. This is really a tremendous web site. You are my intake, I own few blogs and often run out from post :). “The soul that is within me no man can degrade.” by Frederick Douglas. you’re in reality a excellent webmaster. The site loading pace is incredible. It seems that you’re doing any unique trick. Moreover, The contents are masterwork. you’ve done a magnificent job on this matter! Absolutely pent content, thank you for information. “He who establishes his argument by noise and command shows that his reason is weak.” by Michel de Montaigne. Thank you, I’ve recently been searching for information about this subject for a while and yours is the greatest I’ve discovered so far. But, what about the conclusion? Are you sure concerning the supply? I genuinely enjoy examining on this internet site , it contains superb content . “Dream no small dreams. They have no power to stir the souls of men.” by Victor Hugo. I genuinely enjoy looking at on this web site, it has got great blog posts. “Don’t put too fine a point to your wit for fear it should get blunted.” by Miguel de Cervantes. Hello, Neat post. There is a problem along with your site in web explorer, would check this… IE still is the marketplace leader and a large component to people will leave out your wonderful writing because of this problem. It is really a great and useful piece of information. I am happy that you just shared this helpful info with us. Please stay us informed like this. Thanks for sharing. My husband and i felt very glad that Jordan could carry out his reports because of the ideas he discovered through your site. It’s not at all simplistic just to find yourself giving out guidelines other folks might have been selling. We really see we have the website owner to give thanks to for that. The type of explanations you’ve made, the straightforward web site menu, the relationships you will assist to create – it is everything overwhelming, and it’s making our son and our family feel that this content is interesting, and that is rather serious. Thank you for the whole lot! I truly enjoy studying on this website , it has got good posts . “Do what you fear, and the death of fear is certain.” by Anthony Robbins. I simply had to appreciate you once again. I do not know what I could possibly have followed in the absence of the entire ideas documented by you about my problem. It had been an absolute challenging matter in my view, but considering a new professional way you resolved it forced me to jump for delight. I’m happy for the support and as well , believe you know what a powerful job your are carrying out teaching most people thru your website. I am certain you haven’t met all of us. Thanks, I’ve recently been looking for information about this topic for a long time and yours is the best I’ve found out so far. However, what in regards to the bottom line? Are you sure about the source? I must voice my admiration for your kind-heartedness giving support to those people that have the need for guidance on in this niche. Your special commitment to getting the solution around appears to be exceedingly functional and has made individuals much like me to arrive at their ambitions. Your own warm and friendly information entails a lot to me and still more to my peers. Thanks a lot; from each one of us. What i do not realize is in fact how you are no longer actually much more smartly-appreciated than you might be right now. You’re so intelligent. You already know thus significantly with regards to this subject, made me individually believe it from numerous varied angles. Its like men and women don’t seem to be fascinated until it’s something to do with Girl gaga! Your individual stuffs nice. All the time care for it up! Hello my friend! I wish to say that this article is amazing, great written and come with approximately all vital infos. I would like to look extra posts like this. My spouse and i got absolutely satisfied Chris could round up his research through the ideas he was given while using the site. It is now and again perplexing just to choose to be making a gift of facts that a number of people could have been trying to sell. Therefore we grasp we have the website owner to give thanks to for this. These explanations you made, the easy website navigation, the relationships your site aid to engender – it is most remarkable, and it is facilitating our son in addition to our family know that that article is satisfying, which is certainly exceedingly mandatory. Thank you for everything! I¡¦m no longer sure the place you are getting your info, however good topic. I needs to spend some time learning much more or understanding more. Thank you for great info I used to be searching for this info for my mission. I will immediately grasp your rss feed as I can’t to find your e-mail subscription link or newsletter service. Do you’ve any? Kindly permit me recognize so that I could subscribe. Thanks. I will right away grasp your rss as I can’t find your e-mail subscription hyperlink or newsletter service. Do you have any? Please let me recognize in order that I may just subscribe. Thanks. you are actually a excellent webmaster. The site loading speed is incredible. It seems that you are doing any unique trick. Moreover, The contents are masterwork. you’ve performed a magnificent task in this matter! I wanted to create you the little note to be able to say thanks a lot once again for all the amazing information you have shown above. It was really wonderfully generous with you to make easily exactly what some people might have marketed for an electronic book to make some profit for their own end, specifically given that you might well have done it if you ever decided. The creative ideas as well worked to become a fantastic way to know that someone else have the same desire similar to my own to see significantly more concerning this matter. I think there are several more pleasurable sessions ahead for those who read carefully your site. Magnificent website. Plenty of helpful info here. I¡¦m sending it to a few pals ans additionally sharing in delicious. And certainly, thank you to your sweat! You made a few nice points there. I did a search on the issue and found most people will have the same opinion with your blog. Thank you for another magnificent post. The place else may anybody get that type of information in such an ideal method of writing? I’ve a presentation subsequent week, and I’m at the search for such info. I will right away grasp your rss feed as I can’t in finding your e-mail subscription link or e-newsletter service. Do you’ve any? Please allow me recognise so that I may just subscribe. Thanks. whoah this weblog is magnificent i really like studying your articles. Stay up the good work! You recognize, many people are hunting around for this information, you could aid them greatly. I’ve been browsing on-line greater than three hours today, but I by no means discovered any attention-grabbing article like yours. It¡¦s beautiful value sufficient for me. In my view, if all website owners and bloggers made excellent content material as you probably did, the net shall be a lot more helpful than ever before. obviously like your website but you have to take a look at the spelling on quite a few of your posts. Many of them are rife with spelling problems and I to find it very bothersome to tell the truth then again I’ll certainly come again again. Usually I do not learn article on blogs, however I would like to say that this write-up very pressured me to take a look at and do so! Your writing taste has been surprised me. Thank you, very nice post. Nice 1 i like it very much my friend! I do agree with all of the concepts you’ve presented in your post. They’re really convincing and will certainly work. Nonetheless, the posts are too brief for newbies. Could you please lengthen them a little from next time? Thanks for the post. I¡¦ve read some just right stuff here. Certainly worth bookmarking for revisiting. I surprise how so much attempt you put to create such a wonderful informative site. I enjoy reading through and I conceive this website got some truly utilitarian stuff on it! 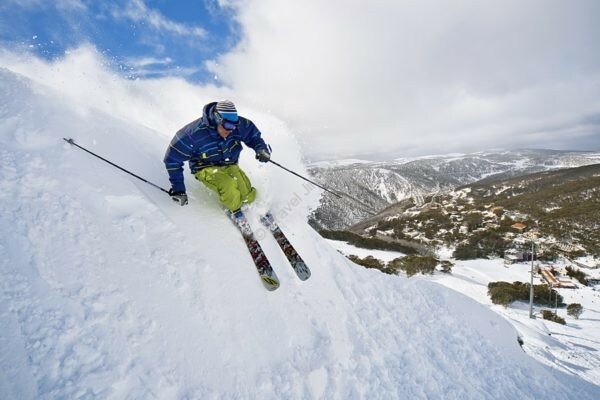 Great post, I think people should larn a lot from this site its real user pleasant. So much superb information on here :D.
I keep listening to the rumor talk about getting boundless online grant applications so I have been looking around for the top site to get one. Could you tell me please, where could i find some? Excellent post. I was checking constantly this blog and I am impressed! Extremely useful info specifically the last part 🙂 I care for such info a lot. I was looking for this certain information for a very long time. Thank you and best of luck. Hey very nice site!! Man .. Excellent .. Superb .. I’ll bookmark your site and take the feeds additionally¡KI’m satisfied to search out so many helpful info right here within the publish, we need work out extra strategies on this regard, thanks for sharing. . . . . . I must voice my gratitude for your generosity giving support to those people who should have help on this important concept. Your very own dedication to getting the solution all around ended up being pretty good and have always encouraged ladies just like me to get to their goals. Your own warm and friendly key points indicates so much to me and even more to my fellow workers. With thanks; from everyone of us. Very good written information. It will be supportive to everyone who employess it, including me. Keep up the good work – i will definitely read more posts. Hi, Neat post. There’s a problem with your website in internet explorer, may check this¡K IE still is the marketplace leader and a good component of folks will leave out your wonderful writing due to this problem. Well I really enjoyed studying it. This information offered by you is very constructive for accurate planning. I would like to thnkx for the efforts you have put in writing this web site. I’m hoping the same high-grade website post from you in the upcoming as well. In fact your creative writing abilities has inspired me to get my own site now. Really the blogging is spreading its wings rapidly. Your write up is a great example of it. Thanks a bunch for sharing this with all folks you actually realize what you are talking about! Bookmarked. Kindly additionally seek advice from my web site =). We may have a link change agreement among us! Great post. I was checking continuously this blog and I am impressed! Very helpful info specifically the last part 🙂 I care for such information much. I was seeking this particular information for a long time. Thank you and good luck. excellent submit, very informative. I ponder why the opposite experts of this sector do not understand this. You should continue your writing. I am sure, you’ve a huge readers’ base already! Thanks for all of the effort on this web page. Betty delights in going through investigations and it’s really obvious why. All of us hear all of the lively manner you make precious techniques through this web blog and attract contribution from website visitors about this subject so our favorite simple princess is without a doubt being taught so much. Take advantage of the rest of the year. You are doing a good job. I will right away grab your rss feed as I can not in finding your email subscription link or e-newsletter service. Do you have any? Please let me recognize so that I may subscribe. Thanks. Wow, marvelous blog layout! How long have you been blogging for? you made blogging glance easy. The full look of your site is excellent, let alone the content! Hi, Neat post. There’s an issue together with your website in internet explorer, could check this¡K IE still is the marketplace leader and a big component to people will miss your magnificent writing because of this problem. I just wanted to send a quick note to say thanks to you for all the awesome tips and hints you are sharing on this website. My incredibly long internet search has at the end of the day been recognized with extremely good knowledge to share with my classmates and friends. I ‘d tell you that many of us visitors are really fortunate to exist in a really good community with very many brilliant people with great tricks. I feel quite fortunate to have encountered your website and look forward to tons of more fun minutes reading here. Thanks once again for a lot of things. Valuable information. Lucky me I found your website unintentionally, and I’m stunned why this coincidence did not came about in advance! I bookmarked it. Whats Going down i am new to this, I stumbled upon this I’ve discovered It absolutely useful and it has aided me out loads. I am hoping to contribute & help other customers like its aided me. Good job. You could definitely see your expertise in the paintings you write. The world hopes for even more passionate writers like you who aren’t afraid to mention how they believe. At all times follow your heart. Required to write you a very small term to thank you yet again concerning the nice suggestions you’ve contributed here. It’s always so sweet and full of a lot of pleasure for me and my workplace coworkers to search your site at the minimum of thrice in a week to see the new advice you have got. Howdy very cool web site!! Guy .. Excellent .. Wonderful .. I will bookmark your website and take the feeds also¡KI am satisfied to find numerous helpful info here in the put up, we’d like develop more techniques on this regard, thanks for sharing. . . . . .